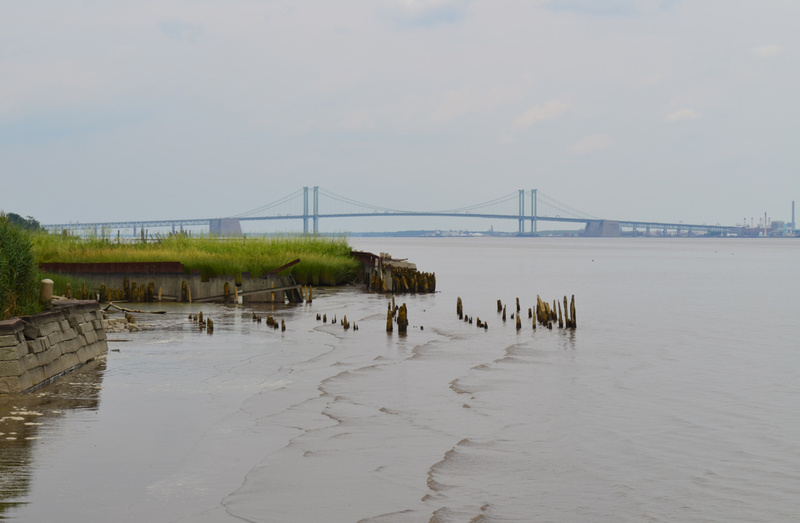 The Delaware Memorial Bridge stands prominently in this northward view from Battery Park in New Castle on July 31, 2013. 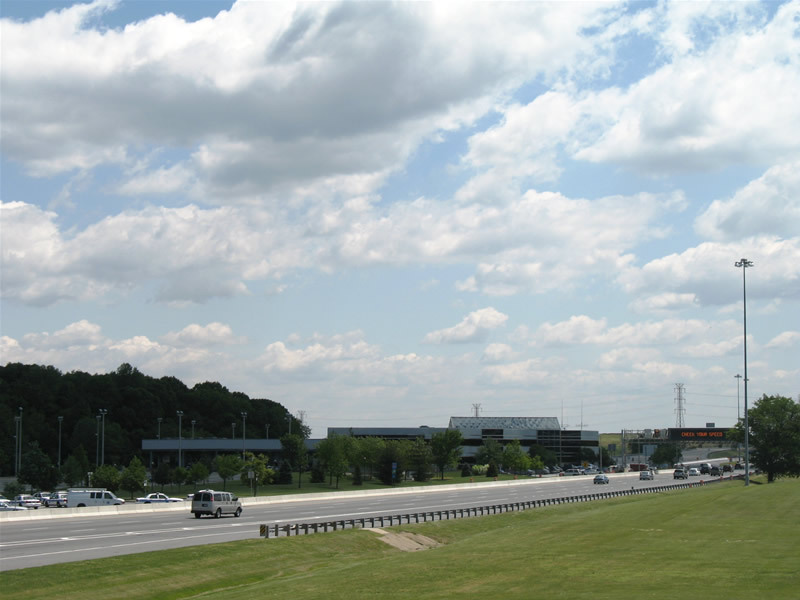 Part of a corridor between the Baltimore / Washington metropolitan area and North Jersey / New York City, Interstate 295 in Delaware provides an important link between Interstate 95 and the New Jersey Turnpike. Varying between six and eight lanes, the freeway also serves regional traffic on the Delmarva Peninsula and local commuters between Newport, Wilmington and New Castle. U.S. 40 overlaps with I-295 between Dupont Highway at Farnhurst and the New Jersey Turnpike. The Delaware River and Bay Authority (DRBA) maintains Interstate 295 between I-95 and the New Jersey Turnpike. The freeway overall comprises a 93.77-mile route between I-95 outside Newport, Delaware and I-95 and I-276 at Levittown, Pennsylvania. The designation previously ended opposite I-95 at U.S. 1 in Trenton, New Jersey. It was extended westward to Bucls County in Spring 2018 ahead of the September 23, 2018 relocation of I-95 onto the Pennsylvania Turnpike. The southern terminus lies within the expansive interchange connecting I-95 & U.S. 202, Interstate 495 (Wilmington Bypass) and Delaware 141 (Newport Freeway) east of Christiana Marsh. I-95 (Delaware Turnpike) expands to five lanes northbound at the split with I-295. Two lanes are allocated for I-295 and a c/d roadway for Delaware 141 north (Exit 5B) and three for I-95 and I-495 north. Ramps also connect with I-295 north from I-95, I-495 and Delaware 141 southbound. During peak travel hours and holiday travel periods, traffic congestion is routine at the northbound I-95/295 split. Delays often occur during holidays at the Delaware Memorial Bridge toll plaza southbound as well. Constructed in 1951 to provide access between Dupont Highway and the new Delaware Memorial Bridge, the Farnhurst interchange joins I-295/U.S. 40 with U.S. 13. Initial work to rebuild the exchange at U.S. 13 commenced in 1999. Further reconstruction of I-295 from 2001 to 2003 resurfaced the entire freeway and rebuilt the interchange with Delaware 9 (New Castle Avenue). Accommodating relocation of the ramp from I-295 southbound to U.S. 13 (Dupont Highway) south, work at Farnhurst removed the left side ramp from U.S. 13 south to I-295 north. A left turn from Dupont Highway south to the northbound on-ramp for I-295 from U.S. 13/40 replaced that connection. 1960s guide signs for Interstate 295 north & U.S. 40 east that were posted ahead of the cloverleaf interchange with Delaware 9 (New Castle Avenue). Tolls along the Delaware Memorial Bridge eastbound span were removed in 1992 as rates along the westbound span doubled to $1.00 per passenger vehicle. Remaining 1960s guide signs along I-295 were replaced by 1998. Photo taken by Michael Summa (1969). Other changes at the Farnhurst Interchange included the addition of a U-turn ramp on the north side of the exchange allowing access to U.S. 13 (DuPont Highway) south from the left exit on I-295 north. This eliminated weaving traffic across the northbound mainline between the I-95/495 entrance ramp and the right side off-ramp for U.S. 13/40. Interstate 295 & U.S. 40 travel between an array of post World War II built subdivisions including Wilmington Manor, Minquadale and Garfield Park among others. Neighborhoods to the south of I-295 were somewhat isolated due to construction of the freeway. Therefore a compromise was made between the state and local residents, resulting in the addition of the Landers Lane off-ramp from Interstate 295 northbound. The local ramp ties into Landers Spur as it serves a number of subdivisions north of Boulden Boulevard and Moores Lane and west of New Castle Avenue. Further east Interstate 295 crosses paths with SR 9 (New Castle Avenue) at a full cloverleaf interchange with collector distributor roadways on both roadways. New Castle Avenue constitutes a four-lane arterial north to Southbridge in Wilmington and south to the historic city of New Castle. Construction between 2001 and 2003 rebuilt and resurfaced the ramps and roadways at the exchange and installed new guide signs in all directions. The Delaware River and Bay Authority (DRBA) offices lie within the median of Interstate 295 & U.S. 40 east of New Castle Avenue. The access road to the facility ties into the northbound c/d roadway of SR 9 and a sidewalk and tunnel connect the DRBA offices with the adjacent War Memorial. The Delaware Memorial Bridge carries Interstate 295 & U.S. 40 across the Delaware River between New Castle, Delaware and Deepwater, New Jersey. The twin suspension bridges carry eight lanes of traffic (four per direction) at a variable speed limit of 50 miles per hour depending upon weather conditions. Lane control signals operated on both spans allow the DRBA to close lanes as needed due to construction, traffic accidents or congestion. 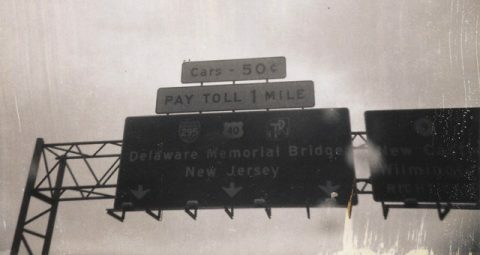 Tolls are levied to westbound travelers across the Delaware Memorial Bridge, with fares collected at a plaza just west of the span. Travelers crossing the Delaware River from New Jersey are charged tolls at a rate of $4.00 per passenger vehicle. The rate was increased from $3.00 in January 2008. Tolls were previously increased from $2.00 per vehicle in May of 2000 to fund a DRBA $150 million capital budget increase. The authority maintains both New Castle County Airport (ILG) and the Cape May-Lewes Ferry in addition to the Delaware Memorial Bridge. Included in the 2000 budget were allocations of funds for the reconstruction project of Interstate 295 in 2001-2003. Tolls along the bridge were switched from two-way to one-way in 1992. DRBA voted on July 17, 2007 to increase tolls from $3.00 to $4.00 per axle for all commercial vehicles crossing the Delaware Memorial Bridge. The toll increases were made to generate $11 million in additional funds for the DRBA budget. $85 million in capital improvements went to expanding Interstate 295 from four to six lanes at the Farnhurst Interchange, replacing the bridges over the Norfolk Southern Railroad east of the toll plaza, and other projects associated with the Cape May Lewes Ferry. An additional toll increase was forecast for 2010 to fund $300 million in future projects including a bridge deck replacement on both of the twin spans.2 That increase had yet to occur as of the end of 2015. 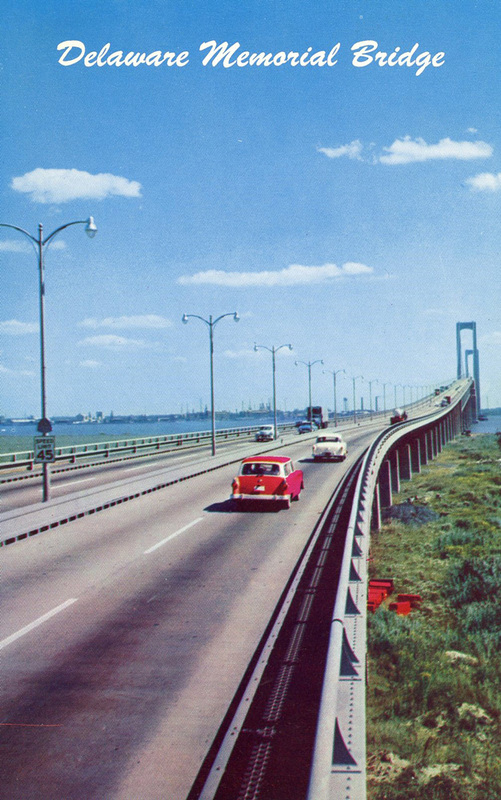 The eastbound span of the Delaware Memorial Bridge opened to traffic in August of 1951.1 Previously motorists used one of two ferry crossings between Delaware and New Jersey. The U.S. 40 ferry linked New Castle, Delaware with Deepwater, New Jersey. A second ferry crossing carried drivers from Wilmington, Delaware to Penns Grove, New Jersey via the multi state route of SR 48 and NJ 48. Both ferry services ceased operations when the bridge opened. 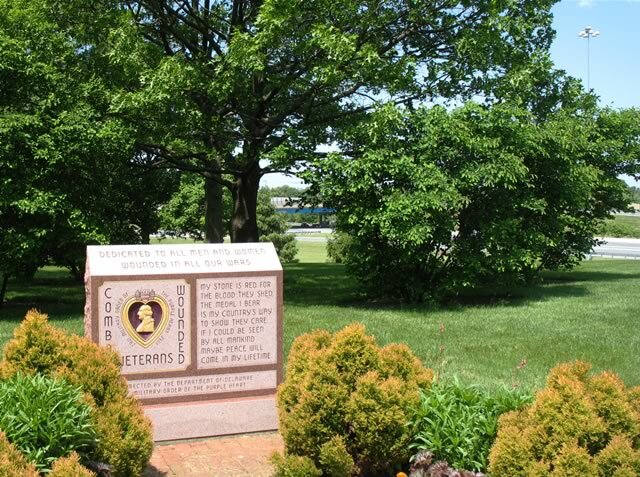 Veterans Memorial Park occupies the southeast quadrant of the exchange joining I-295 & U.S. 40 with Delaware 9. 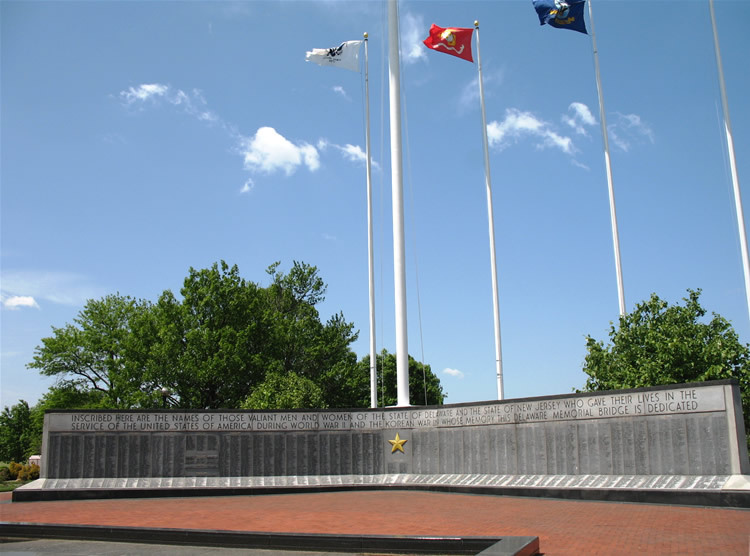 Interstate 295 is part of the Blue Star Memorial Highway system that honors the armed forces. 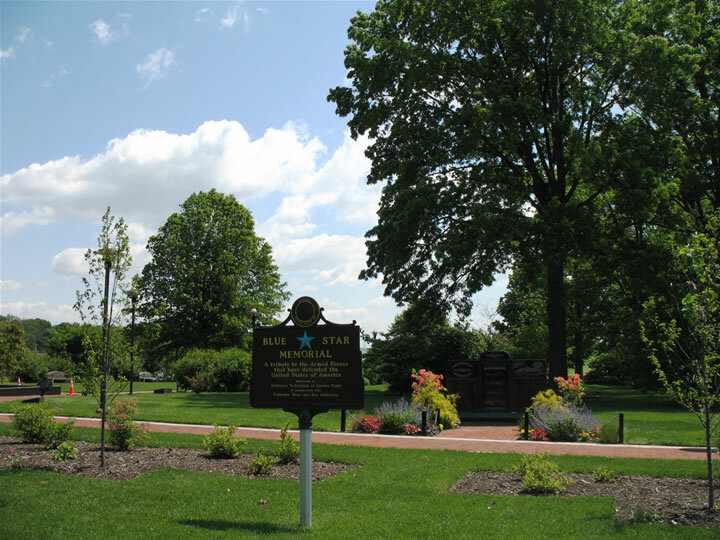 The Blue Star represents the blue star in the service flag, which was used during World War II on flags and homes of families who had a loved one serving overseas. 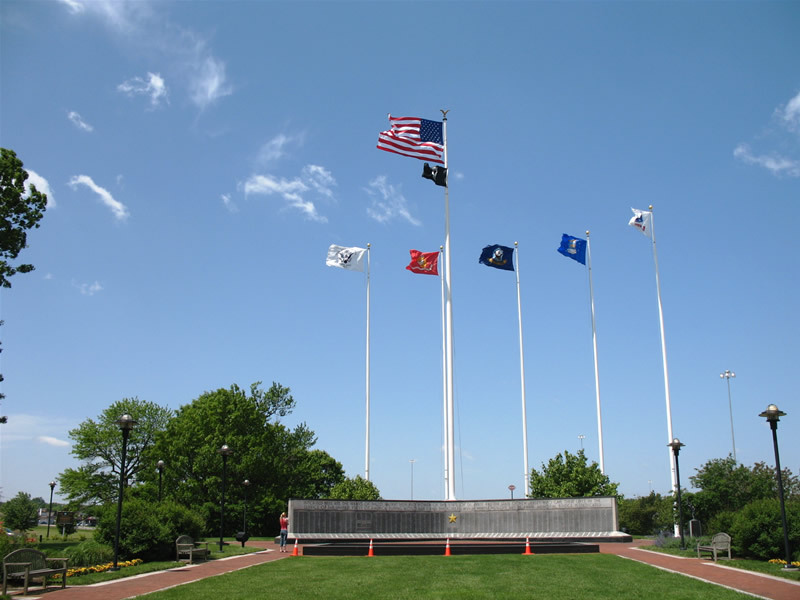 The names of all armed service members from Delaware and New Jersey who lost their lives during World War II, the Korean War, the Vietnam War, and the Gulf War are inscribed on walls at Veterans Memorial Park. The bridge represents a lasting memorial to soldiers who gave their lives in those conflicts. An Interstate 295 trailblazer directs motorists west from Veterans Memorial Park to Delaware 9 (New Castle Avenue) north. Photo taken 05/19/07. The full cloverleaf interchange between Interstate 295 and Delaware 9 lies just north of Cherry Lane. The eastbound off-ramp from I-295 ties into Cherry Lane from just across New Castle Avenue here. Photo taken 05/19/07. The Delaware Memorial Bridge http://www.hsd.org/DHE/DHE_where_transport_DMB.htm, Historical Society of Delaware. "Toll hikes proposed for Del. Memorial." The News Journal (Wilmington, DE), June 8, 2007. "Heads up, I-295 drivers, construction is coming." The News Journal (Wilmington, DE), December 9, 2015.